With the new custom restore feature you can selectively restore data to your new device, e.g. restore only contacts, photos or messages to an iPhone. However, there are certain limitations that you should know before making a Custom restore with CopyTrans Shelbee. Some data might not be transferred unless the backup is encrypted, e.g. Wi-Fi passwords won’t be transferred. For the complete and secure Custom restore, we highly recommend enabling backup encryption on both devices. Save your password in a safe place after creating it. The next time you restore your data, you’ll be asked for this password and you cannot restore unless you enter the correct one. CopyTrans Shelbee and iTunes cannot help you recover a forgotten password, but you can try our suggestions to recover it. 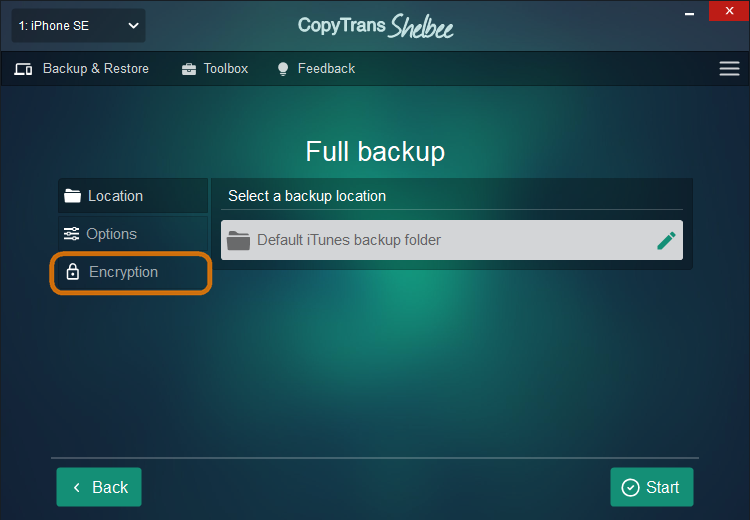 In CopyTrans Shelbee navigate to Backup > Full backup and click the “Encryption” button. Add a password. To secure your iPhone backup with a password, (1) click the “Add a password” tab, (2) create and confirm your password, (3) click “Apply” and (4) initialize the backup by clicking “Start”. If you want to selectively restore cloud contacts, calendars, or notes to a new device, please make sure to also select Accounts. This is important as otherwise not all the data will be transferred. NOTE: Selecting Accounts will overwrite the already existing mail accounts and any associated cloud account information (contacts, calendars, notes, iMessages) on the destination device. Due to Apple’s restrictions, you have to re-download all your apps from the App Store after the restore is finished. As soon as you download the app on your device, the app data will be automatically restored. For example, if you redownload Candy Crush Saga your scores will be transferred. You won’t be able to restore the app data if the app was removed from the App Store. Some app documents (e.g. movies in VLC for Mobile), Photo Library, and Music Library won’t be transferred. 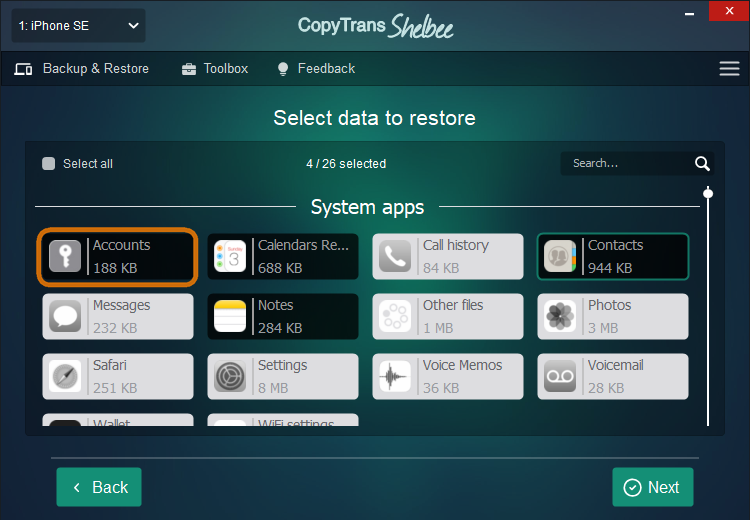 Please see what does a CopyTrans Shelbee backup include. 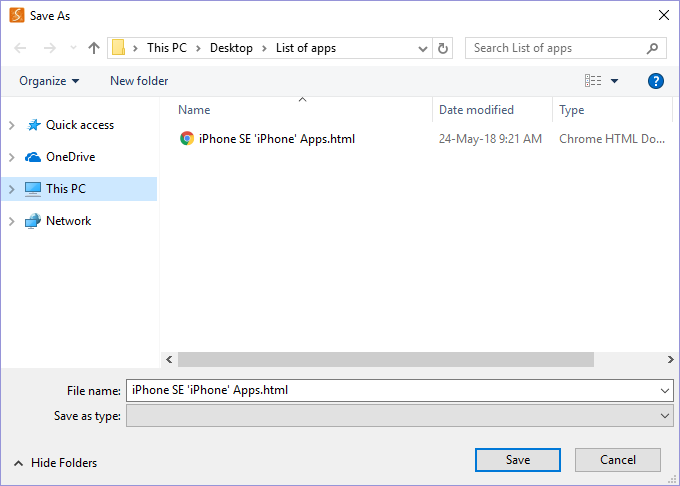 Choose the folder where you will keep the list of apps and hit “Save”. 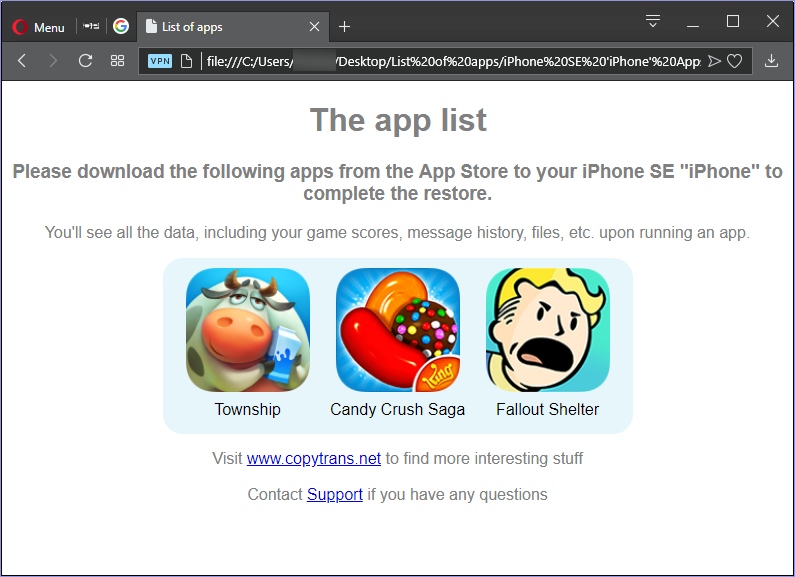 After that, a window will open automatically showing you all the apps you need to download again to your device. 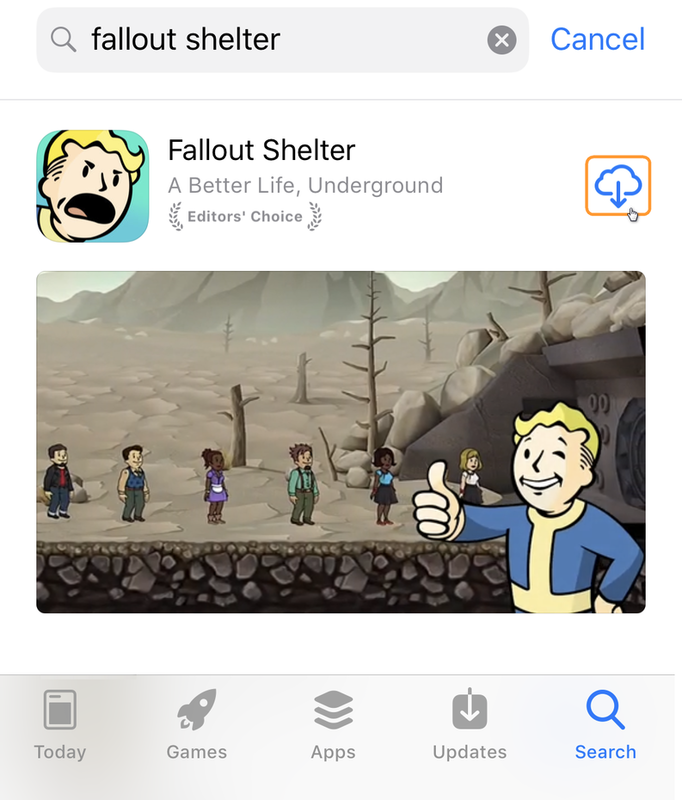 Go to App Store and search for the app. When found, click on the cloud symbol to download it back. 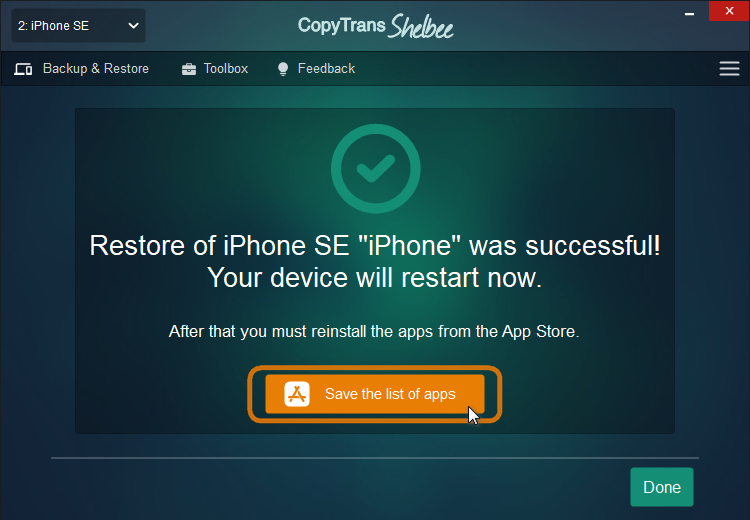 СopyTrans Shelbee supports all versions of iOS starting from iOS 9 till the very last iOS 11. Prior to the restore, make sure that the iOS version of the destination device is at least the same as the iOS version of the backup. That is if you make a backup of an iPhone running iOS 11 you won’t be able to restore to an iPhone with iOS 10. However, if you have an iOS 10 backup you can easily restore to a device running iOS 11.